1. 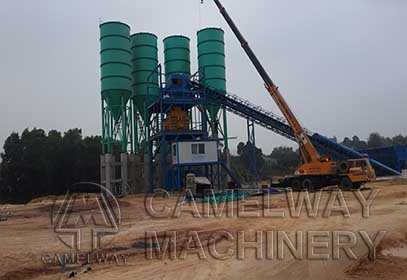 Basic level of small concrete mixing plant should be tested by gradienter and super leveling instrument. Otherwise, it will cause great damage. 2. Embedded iron should be prepared according to drawing requirements of small concrete mixing plant and the size of embedded iron should not be changed at all. If the size of embedded iron must be changed, the technical guidance personnel working in the construction sites must know about it clearly. 3. The size of the steel mesh and the steel anchor should not be smaller than the size in the drawing requirement. The width and depth of the foundation should also not be smaller than the drawing requirements. 4. Users had better not change the drawing size. If it is necessary make a change, inform the technical guidance personnel. 5. The size error between two construction sites should not be bigger than 50mm. Mark the center and the size range of the foundation with lime. 6. When digging the foundation, put the steel and the peg into the center of foundation. The center line of the embedded iron on the same foundation must be in the same line and the deviation should not be bigger than 20mm. 7. Before finishing pouring the concrete, the embedded iron must be horizontal to the ground. There should not be torsional angle and off center phenomenon.